While it may still feel like the first sunrise of 2016 was only yesterday, this year’s is already close! The first sunrise of the year is always extra special as the emerging sunlight seems to represent all our hopes and dreams for the year ahead. If you want to welcome 2017 in with one of Jeju’s most beautiful sunrises, then please check our recommendations for the top five places to see a sunrise in Jeju. The Mt. Hallasan National Park Management Office gives hikers the chance to climb Mt. Hallasan during the night every New Year. Night climbers can ascend to the summit using the Seongpanak Trail from midnight. Mt. Geumsan, Mt. Jirisan and Mt. Hallasan are the three most sacred mountains of Korea. At 1950m, Mt. Hallasan is the highest of the three and from its summit, you will be able to see the sun rise over Jeju’s 360 oreums. For the safety of climbers, Mt. Hallasan National Park Management Office sets up safety ropes and flags for safe and easy night climbing. If you want to start the year ahead of most, then you must visit Sunrise Peak for one of its famous sunrises. As the most easterly place on Jeju island it is the first place where the sun rises in Jeju and as such it is the perfect place to get a head start on the year. If you climb to the top of the peak, you will be able to see the 99 sharp rocks that crown the peak’s crater. Sunrises from the summit are sublime and make for some of the most spectacular views in the whole of Jeju. People who opt to take in the sunrise from the bottom of the peak will also not be disappointed. From here, the blaze of the first sunrise creeping over the horizon seems like it is blessing all of those watching. The Jeju sea shines behind the peak and visitors will be sure that they have one of the best views of a sunrise on Jeju. 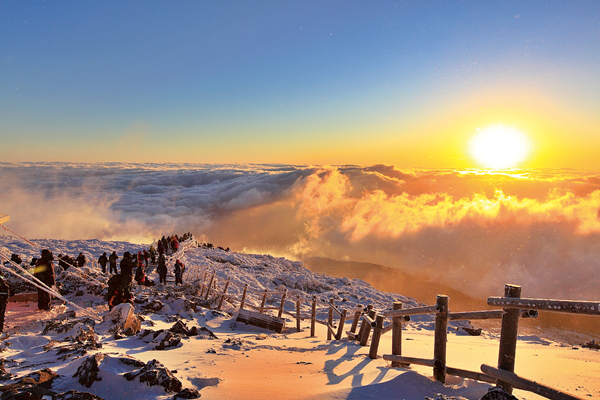 Sunrise Peak was designated as a UNESCO World Natural Heritage site and is visited by thousands of tourists every day. Originally it was a volcanic island in the ocean but sand and gravel around the volcanic island formed a path to link the peak with the Jeju mainland. The cone-shaped volcanic edifice, Seoubong Peak, located at the eastern side of Hamdeok Beach, is one of the best places on Jeju to view a sunrise. The peak is named due to the shape of the big and small peaks of the oreum, which resemble a giant water buffalo emerging from the water. After a light walk to reach the top of the oreum, you can enjoy the wide open view and sunrise from the top of the peak. Hyeongje Island is one of the best places to view a sunrise in the west of Jeju. The two rocks of the island stand facing each other just off the coast of Sage-ri in the southwest of Jeju. When the red morning dawn shines through the gap between the two rocks, even the hardiest traveler will surely be touched by the magic of the scene. The sunrise in Hyeongje Island is famous among photographers who like to shoot the beauty of the scenery and the enchanting sunrise. For an alternative view of the Sunrise Peak sunrise, you can climb Jimi-bong. From the top of this oreum you get panoramic views that take in both Udo and Sunrise Peak. This is a recommended spot amongst locals due to its magnificent sunrise. If you are lucky, you can enjoy the view of flying birds in front of the sunrise on the first day of the year.